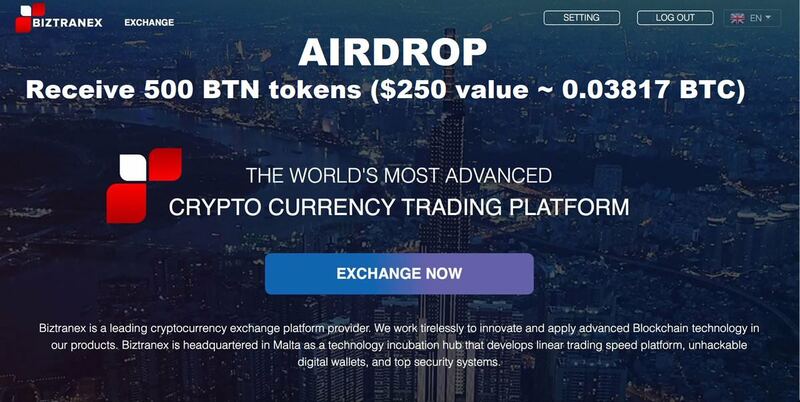 Biztranex has implemented the BTN Airdrop Promotion for all of our Verified Accounts. We want to ensure that you have received a notification about the deadline for completing the verification process in order to receive Airdrop from Biztranex, provided that you are one of the first 30,000 accounts that got verified as previously announced. • 2,000 BTN per account for the first 1,000 verified accounts + bonus 200 BTN for each verified "Direct Ref link"
• 1,000 BTN per account for the next 5,000 verified accounts + bonus 100 BTN for each verified "Direct Ref link"
• 500 BTN per account for the next 24,000 verified accounts + bonus 100 BTN for each verified "Direct Ref link"
• Biztranex would like to announce the closing time for this Verification Promotion is 17:00 (UTC + 7) on 15th of October, 2018. After this time, Biztranex will stop this BTN Airdrop Promotion. The program may end sooner than expected if 30,000 accounts have been fully verified before the closing time. Note: - The time to submit and verify personal information is the end of October 3, 2018. - BTN payment date is from 5-8 October 2018. Biztranex would like to announce the closing time for this Verification Promotion is 17:00 (UTC + 7) on 15th of October, 2018. After this time, Biztranex will stop this BTN Airdrop Promotion.